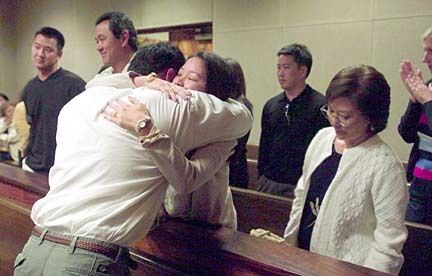 Gabriel Kealoha hugged his wife, Renee, after hearing the verdict in court exonerating him of a charge of sexual assault. A Circuit Court jury found Wahiawa Middle School teacher Gabriel Kealoha not guilty yesterday of sexually assaulting a student in May 2001. Kealoha, 30, who taught social studies and Hawaiian language, had been charged with three counts each of second-degree and fourth-degree sexual assault and was facing a maximum 10-year prison term if convicted. Defense Attorney Victor Bakke said the charges and trial have been an "ordeal" for Kealoha, who left the courthouse without comment. Kealoha has been on paid administrative leave since the fall of 2001 when the girl told her parents she was assaulted and police arrested him. "It means he's not going to jail, but it's doing nothing to heal the community at the school," Bakke said. "It's unknown whether he'll be able to go back and teach, at least not at that school because this is going to hang over his head forever. ... There's people that will always believe he's guilty, and that will follow him forever." Deputy Prosecutor Lucianne Khalaf said the girl's family is "devastated" over the verdicts but continues to support the girl. Family members broke into sobs and wiped away tears as the verdicts were read and left the courthouse without comment. Khalaf said the family understands that the verdicts do not represent the truth of what happened, but that the evidence presented did not persuade the jurors beyond a reasonable doubt. "Obviously, to the girl's family, the truth is their child had been sexually assaulted." Khalaf voiced concern that the jury took only 1 1/2 hours to deliberate. "There was a considerable amount of evidence to sort through, and the fact they rejected the state's case so quickly without barely having time to look at it all -- it's very disappointing," Khalaf said. Attorney Paul Cunney, who also represented Kealoha, said the length of time the jury took indicated a "strong lack of evidence" that the girl had been sexually assaulted. Khalaf said the case boiled down to credibility and the girl's word against Kealoha's. "When you have a teacher with a reputation and the status that goes with that, for most people that's very difficult to overcome." There were three teachers on the jury, but they all indicated during jury selection that they could be fair and decide the case based on the evidence. One juror who was contacted declined to discuss their deliberations. Kealoha was well liked at the school by his fellow teachers and students. His peers voted him Wahiawa Middle School's Teacher of the Year in 2000-2001, after only two years of teaching there. The Wahiawa girl, who was 13 and an eighth-grader at the time, had testified that Kealoha was driving her home after they had watched the ending of a soccer game on May 27, 2001, when he took a detour to pick up a video at his classroom. It was inside his classroom that she said he began touching her and sexually assaulted her on a futon bed. She said she did not tell her parents what happened because she was "scared." Bakke maintained the girl was disturbed, had a history of lying and had made up the story about being sexually assaulted to get attention and sympathy because she was having problems in school and at home. Kealoha, who did not take the stand, does not dispute he and the girl were at his classroom that day to pick up a video but maintains nothing happened and that he dropped her off at home. The verdict does not mean Kealoha can return to the classroom immediately. Department of Education spokesman Greg Knudsen said the school's investigation into the girl's allegations had been on hold because of the criminal proceedings and will resume now that a verdict has been reached. Kealoha will remain on administrative leave. "Just because he's been found innocent, it doesn't relieve the department from completing its investigation and reaching its own conclusions," Knudsen said.